Crosby Carpenter Selected to Serve as New Liberty Bell Jr-Sr High School Principal :: Methow Valley Schools • Every Student Shines! The Methow Valley School District is pleased to announce the hiring of Crosby Carpenter to serve as the new Liberty Bell Jr-Sr High School Principal. Carpenter will assume the position effective July 1, 2019, following the retirement of Deborah DeKalb, current Liberty Bell Jr-Sr HS principal. Carpenter grew up in Snohomish before attending Western Washington University. After graduating with a degree in Natural Resource Management, he joined Teach for America where he taught physical and environmental science on the Navajo Nation. Following his time spent teaching on the Navajo Nation, Carpenter spent several years gaining valuable skills working in construction industry building houses in the Seattle area, eventually returning to pursue his passion – teaching. Crosby obtained his Master in Teaching degree from Western Washington University and returned to the classroom where he taught a variety of classes at Granite Falls High School and Chelan High School. Some of the coursework he taught included: entrepreneurship, economics, marketing, sustainable design, and architectural design & construction. 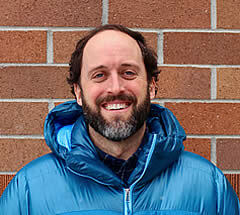 More recently, Carpenter has served as the principal of Chelan School of Innovation, an alternative high school affiliated with Big Picture Learning and Associate Principal of Chelan High School. Carpenter, his wife Andria, and their dog Oskar have lived in the Methow for four years. His interests outside of education include mountain biking, skiing of any kind, traveling, drinking coffee, and cooking. Please join us as we welcome Crosby Carpenter!